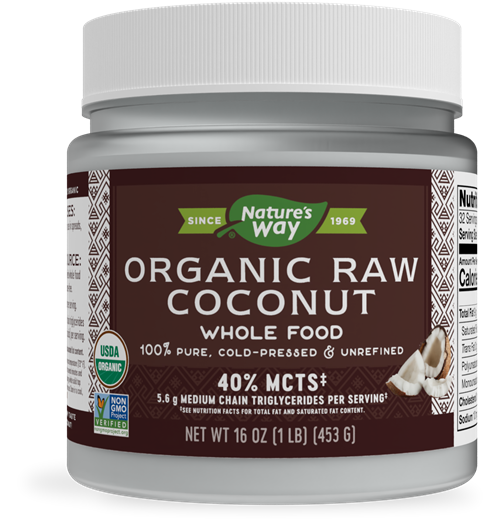 Organic Raw Whole Coconut / 16 oz - Nature's Way®. Premium Quality: From pure, unrefined, unbleached, non-GMO coconuts; Hexane-free. Variety of Uses: Enjoy straight from the jar or use in spread, dips, baking & more! Dietary Fiber: Provides 2 grams per serving. 40% MCTs‡: 5.6 g medium chain triglycerides (lauric, caprylic and capric acids) per serving. NOTE: Spreads easily when warmed above room temperature (73° F). To soften or liquify, place jar in hot water for several minutes and stir. Coconut oil separation may occur, causing a white solid top layer. To resolve, simply warm and stir before use. Store in a cool, dry place. No Refrigeration Necessary.